We’ve got a naturally sweet date caramel base, topped with crunchy pecan and smooth raw almond butter all covered in rich dark chocolate: what can really go wrong here, right? Share this goodness over the upcoming holidays with your loved ones and we guarantee they will all be shocked to learn that these little devils are raw, vegan, gluten-free and super healthy. 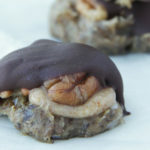 Now let’s make some Vegan Pecan Turtles! Place all bottom caramel layer ingredients into your food processor and blend until smooth stopping to scrape down the sides (keep blending and scraping until the mixture is smooth and dough-like). Line a bowl with saran wrap and scrape caramel dough into it. Line a large baking pan/sheet with a parchment paper. Once the dough is firm enough (but not frozen) remove from the freezer and start to roll into small golf ball size balls. Place them onto a prepared baking sheet and press down with back of a tablespoon to flatten. Press in 1 pecan to each flattened ball of caramel. 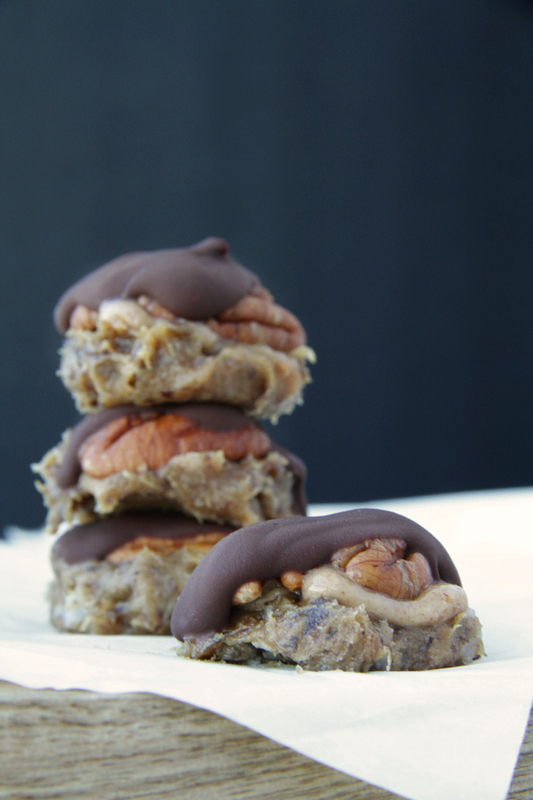 Top each piece with tiny spoon full of almond butter. Now place the baking sheet back in the freezer for another 15-20 minutes. Meanwhile prepare the top chocolate layer. Place a clean glass or stainless steel bowl over a saucepan of hot water (bain marie). Ensure the bottom of the bowl does not touch the water and no water goes inside the bowl. Now add all chocolate ingredients in and allow to melt slowly. Don’t keep the water boiling, turn the heat off and just give it a quick blast every so often if necessary. Keep stirring it thoroughly with a balloon whisk or fork, until it starts to slightly thicken. The chocolate should still be runny and easy to pour. Set aside. Remove flattened caramel pecans from the freezer. Using a spoon cover each caramel with chocolate evenly using the back of the spoon to cover the sides and to smooth out the top of each caramel. Let each chocolate set for a few moments before moving. Enjoy or carefully place in a parchment lined container and store in the freezer. 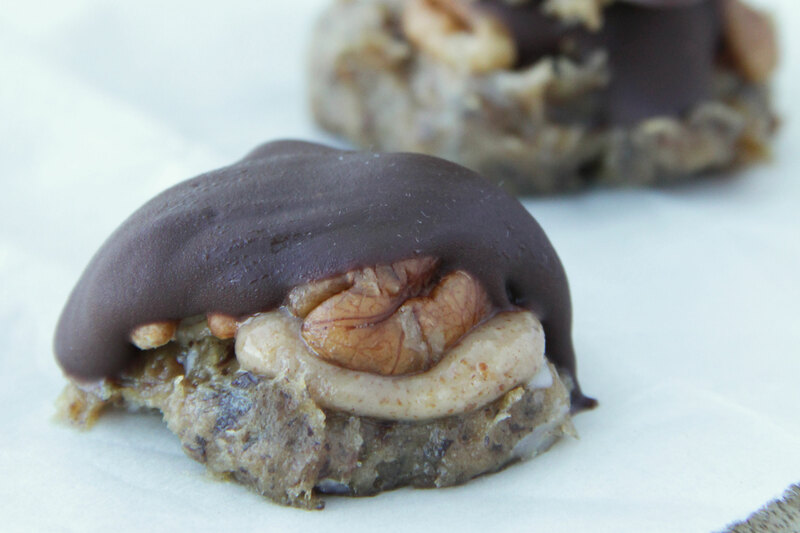 These treats are delicious straight from the freezer as they keep a really nice consistency. Ok, now sit back, put your feet up and enjoy a piece.